Morty attempts to save a life. Of course, he's saving it from a hit-man who obtains all his weapons from Rick. And Rick doesn't want to bother, since he'd rather play the video game implementation of the life of a potential carpet store salesman. All of this after dumping Jerry off at a daycare center for various Jerrys. Oh, Jerry. They just keep on writing you so well, in part, because, you're so simple. I was kind of surprised there wasn't some lifesize giant version of his phone app game of popping balloons. Pro Tip: If you beat cancer, DON'T GO BACK TO THE CARPET STORE. Haha, I was just making a post about this and then reloaded to make sure it wasn't a double, and there it was! I think it's an interesting thought experiment to ponder what a daycare for infinite copies of oneself might be like. Mine would have a lot of cheese plates, hardboiled detective novels...X-Files episodes...oh man, I would totally watch Rick & Morty all the time in my Jerry Daycare. Probably the longer-term residents of the town of cats daycare would form a book club and a writers workshop. The fact that every time Morty takes charge and tries to do the right thing everything blows up in his face makes me wonder if Morty's character development can serve as a sort of origin story for Rick's amoral view of the universe. If every time you try to impose your own earthbound moral framework on a bigger, badder universe you end up discovering that your myopia is screwing you again maybe the eventual lesson is "don't try to impose your own moral framework, ever." Was Rick ever someone who tried to do the right thing? And OMG I loved Krombopulos Michael so much. So sad we just got a tiny glimpse of that character. If Jemaine Clement intends to wander from show to show plying his David Bowie impression, I'm all for it. Grandpa Rick just wanted to enjoy a fun-filled afternoon with his favorite grandkid at Blips and Chitz - his treat! - but instead, Morty bails on him and gets into all kinds of unnecessary trouble. Is it any wonder it's so irritable this whole episode? I guess I'm a teenaged boy at heart, but I laughed every time they said Fart's name. I liked the outline where you could mark any pre-existing damage on your Jerry. The extended Space Oddity-era Bowie pastiche just puts this one completely over the top. The goodbye moonmen song is soooo stuck in my head. The singing was fantastic. Has Jemaine Clement had guest spots in other shows where he has done anything similar? And I loved that "Desired length of stay" had two options: Unknown and Forever. And I was half expecting that one Rick to also hang out at Jerryboree (the Rick that became friends with Jerry last season). But this was a rough ride for Morty. I'm not sure things go bad whenever Morty tries to do the right thing though, I think they mostly go bad whenever Morty has any agency at all. He often tries to do the right thing, but getting a girl to fall in love with you with a love potion mind altering substance is not exactly what I'd call "the right thing", and that didn't work out too great either. Yeah, that's true, even when Morty's trying to do the *wrong* thing it gets screwed up somehow. There goes that theory. I forgot to add that I now am curious about Rick's backstory. Because I totally buy that Rick might have deeply cared about things in the past. And that Morty might be awakening that again in some ways. We haven't seen young Rick at any point, have we? Morty really is his father's son. His efforts, however well-intentioned, fall apart. Even in a virtual world, he lives a dull life. The singing was fantastic. Has Jemaine Clement had guest spots in other shows where he has done anything similar? Well, there's Flight of the Conchords' Bowie's in Space (so many good lines in this song). Otherwise, I don't think his IMDb page doesn't indicate so. I think that's one of the strengths of this show though. They have little incidental characters like that who end up being so interesting and strong. A lot of the silly side characters are better than recurring characters in a lot of other shows. And as this episode showed, they persist in the universe even moreso than they did in futurama. Mr. Meeseeks in the background, for instance. Plus since there are infinite parallel universes we may well run into Krombopulos Michael again! I read an interview with Roiland and Harmon (maybe on AVClub?) that indicated that they are explicitly not interested in telling the story of why Rick is who he is. Ah, here it is. I'm glad they are not interested in telling the story of "The Becoming of Rick". Any backstory they would provide would be kind of disappointing, I guess. Man, I love a good Bowie parody. I could listen to 'Goodbye Moonmen' on repeat for hours. Yea, really. I actually said when watching the first season with a friend while it was still coming out "when and if this show delves into some origin story for rick, it will have clearly and plainly jumped the shark. A lot of adult swim shows have clear failure points where the quality drops way down, like ATHF around episode 40. They may have some good moments after that, but they basically go full zombie simpsons. Hopefully that won't ever happen to this show, but that will be a clear indicator that its happened or is about to. Happy to see them agree that's dumb, but who knows if they won't try and pressure them into it or something. Seriously- why isn't Ball Fondlers an actual show yet? I love that this episode takes something that was profound and moving in The Inner Light and makes it crass and horrible. So deliciously horrible. This is best show. Also, the gear people are a clear reference to the Roboto He-Man figure, right? coda, domo arigato for helping point out that reference just when we needed to...Thank you! Is there any action in this episode where an effort at doing the "right" thing doesn't set up a way bigger mess or at least work out badly for the person doing it? You could make a case that Fart being kept alive rather than immediately executed qualifies - he want to bring back a force to eradicate EVERYTHING, so even for myself as personally opposed to capital punishment I think I'm okay with it here. Though this may not qualify, as Rick's comment about Fart's molecular control would seem to imply he's being kept alive out of greed and a desire to control, not aversion to killing. KM's effort to kill Fart - probably for the best, though he's just in it for the killin' - sets up the escape and leaves KM dead. Morty's efforts to stop the killing puts him in place to cause the release, which slaughters the people holding Fart prisoner. One of the more jaded, longer-staying Jerrys tells Jerry he can just walk out. Which he does, which is traumatic both in the experience and in how it tells him something sad about himself. 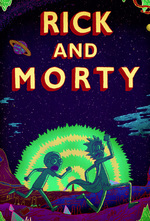 I like how 14 Morty is. Lovably terrible. Full of ideas, Devoid of experience. But this was a rough ride for Morty. I'm not sure things go bad whenever Morty tries to do the right thing though, I think they mostly go bad whenever Morty has any agency at all. It makes the small victories sweeter. And we've all seen sci/fi or sitcoms with the rote happy endings. Rick and Morty is beyond that. My IRL name is Michael, so you can probably guess how I've been referring to myself since watching this. "I communicate through what you call...Jessica's feet. No, *telepathy*." I come to you from the world of 2017* to tell you that, indeed, Clement does a very Bowiesque "Shiny" in the movie Moana. *Just... don't ask me about the election. Please. I could listen to 'Goodbye Moonmen' on repeat for hours.